Vaughn, Cummings, and Hoenig in Columbia. 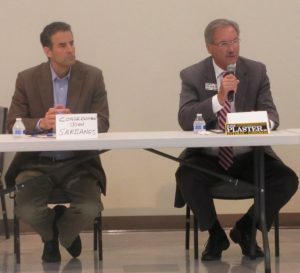 The three incumbent Democratic congressmen who represent Howard County showed up at a forum Saturday to face their opponents. Missing was one challenger, Republican Del. Pat McDonough, who had loudly complained that Rep. Dutch Ruppersberger refused to debate him. “My opponent says I won’t debate him. Yet he’s not here today. I do have a problem that he’s not here,” said Ruppersberger, who has represented the 2nd Congressional District for 14 years. Ruppersberger also had a problem with media coverage of the presidential campaign. Ruppersberger was joined on stage by Reps. John Sarbanes, 3rd District, and Elijah Cummings, 7th, and three of their challengers before a sparse audience that included campaign staff and a couple dozen spectators. They were what remained after a much larger crowd evaporated at the end of the first — and maybe the only — forum for all three U.S Senate candidates on the ballot. Republican Corrogan Vaughn, who got 27 percent of the vote against Cummings in 2014, was not interested in being agreeable. “I’ve watched him be very explosive with people,” Vaughn said, referring to Cummings’ prominent role as ranking Democrat on the House Oversight and Government Reform Committee and the Benghazi Committee. Cummings is seeking his 11th term. At the forum by an African American coalition in the black St. John the Baptist Church in Columbia, Vaughn, who is African American, said, “We need someone who will not be a Stepin Fetchit” for the party, a reference to a black actor from the 1930s who was billed as “the laziest man in the world” and was considered the epitome of racial stereotypes. Vaughn made the reference again at the end of the forum. Vaughn said “Obamacare is as bad as veterans health care,” and repeated recent remarks by former President Bill Clinton that the system is “broke and needs to be fixed. Republican Dr. Mark Plaster, a physician with a publishing firm for doctors and an Iraq war veteran, has been running against Sarbanes for more than a year. He favors a refundable tax credit for health care. “We could actually lower the cost of health care,” Plaster said. “We need people who are willing to cross the aisle,” Plaster said. Asked about taxes, Sarbanes said that Congress needs to “close loopholes for hedge fund managers,” “end tax advantages for moving jobs overseas,” and establish tax credits for campaign contributions. “We have the politics of envy,” Plaster complained. Democrats are “trying to stick it to someone else.” He would like to see a tax code that favors small businesses, helping a lot of women and minorities.